Learn about Native American culture today and how tribal Americans view themselves. Dan Wildcat (Yuchi Muscogee), Professor at Haskell Indian Nations University, examines the critical environmental challenges we face today from the viewpoint of Native American nature-centered beliefs. 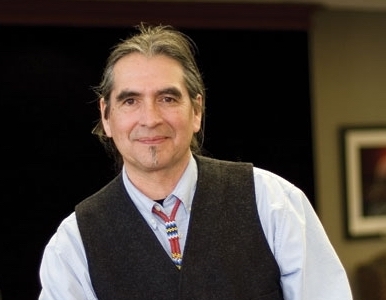 James Rains, (Muscogee), Professor at Haskell Indian Nations University, focuses on the Native American experience embracing the richness of tribal pasts to preserve cultural identify and establish a place in the global economy of the 21st century. Bonnie Lynn-Sherow, Director of the Chapman Center, explores recent efforts and projects underway in Indian Country. This event is part of "Kansas Indians: Walking Paths of Yesterday and Today," a public discussion series examining the social and cultural traditions of Native American tribes in Kansas. Support for this project is provided by the Mariah Fund. Contact the Kinsley Library to register.